The railroad has always had an important association with Route 66, and this is well illustrated in central Flagstaff. A walk along Santa Fe Avenue (Route 66) shows the influence of the railroad on the city’s development, as every building is oriented toward the iron tracks. As automobiles replaced the train as the country’s primary mode of transportation, the Route 66 corridor paralleling the tracks exerted a similar force on development. The Atlantic and Pacific Railroad laid tracks through Flagstaff and the rest of northern Arizona and New Mexico in the 1880s. After the Santa Fe Railroad’s purchase of the line by 1885, Flagstaff became part of a continuous rail connection between St. Louis and the Pacific Ocean. Constructed after an 1888 fire and now used as offices by the Burlington, Northern, and Santa Fe Railway, the sandstone depot was at the geographic center of Flagstaff’s development. The transportation connection enabled regional industries like lumber, cattle, and sheep to develop and thrive. By 1895, tourism was also an important industry, with visitors drawn by the cool summer climate and nearby Grand Canyon, Oak Creek Canyon, Walnut Canyon, and San Francisco Peaks. The National Old Trails Road, an early predecessor of Route 66, followed railroad alignments through Flagstaff and other areas of northern Arizona in the 1910s. Railroad traffic continued to be important, however, and in 1926, the Atchison, Topeka, and Santa Fe Railway built a new, more elaborate railroad depot across from the old one. This Tudor Revival- and Queen Anne-influenced building is the Flagstaff Visitor Center today. U.S. Highway 66 through Arizona was commissioned the same year, and followed the approximate routing of the National Old Trails Road. 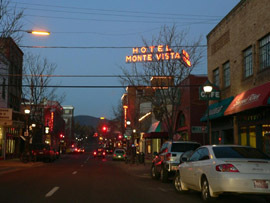 In Flagstaff, this route ran south of the railroad tracks, but it was soon realigned north of the tracks to Santa Fe Ave. A block away on San Francisco Street, community support funded the construction of the Hotel Monte Vista the same year as Route 66’s commissioning. The Romanesque-inspired hotel drew visits from Carol Lombard, Gary Cooper, Spencer Tracy, Jane Russell, and others drawn to Flagstaff’s mountain setting. The hotel continues to host visitors today. At this time Flagstaff was at the end of what one magazine writer described as “18 miles of narrow, crooked, poorly surfaced road which is particularly dangerous in dry weather due to raveling and innumerable potholes.” The Daily Sun described the nearby Motel Du Beau, constructed in 1929 at the intersection of Beaver Street and Phoenix Avenue, as "a hotel with garages for the better class of motorists." Units rented for $2.60 to $5.00 each, and were perfect for the new phenomenon of automobile tourism. Rates are a little higher now, but the Craftsman-style facility provides affordable accommodations to today’s travelers as the DuBeau International Hostel. Military use became a primary function of Route 66 during World War II. Flagstaff hosted a huge ammunition depot then, which brought increased business to the surrounding area and heavy traffic to and from the facility. Tourism boomed at war’s end, and Arizona’s National Parks, mountains, and tribal lands drew travelers to the area. As Interstate 40 was completed through the Flagstaff, business was siphoned away from Route 66 and downtown Flagstaff. During the 1970s and 1980s, many businesses shifted away from the city center, and downtown fell into decline. In 1983, the historical significance of the area was recognized through listing on the National Register of Historic Places. In 1987, the city drafted a new master plan to revitalize downtown into a regional center for shopping, trade, finance, office use, and government. Filling the district now are city services, tourists, residents, and local university students, who flock to the streets to conduct business, sightsee, dine, shop, and relax. 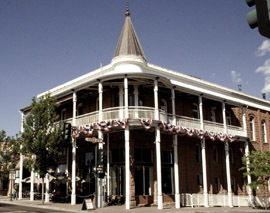 The district still contains many of the historic travel, trade, and social buildings that date from the period between the late 1880s and the 1940s when Flagstaff developed into a regional center for commerce and tourism. The district is a historic stop along Route 66 and a perfect gateway to the surrounding attractions in the region such as Grand Canyon National Park, Sunset Crater Volcano National Monument, Wupatki National Monument, the Coconino National Forest, Meteor Crater, the San Francisco Peaks, the Red Rocks of Sedona, and neighboring American Indian nations. The Railroad Addition Historic District includes portions of Santa Fe Ave./Route 66, Aspen Ave., Leroux St., and San Francisco St. in Flagstaff, AZ and is bounded by Birch Ave., the Santa Fe Railroad tracks, Beaver St., and Agassiz St. The Flagstaff Visitor Center in the old train station at 1 East Route 66 is open Monday-Saturday 8:00am to 5:00pm and Sunday 9:00am to 4:00pm; it is wheelchair accessible and admission is free. For information, call 928-774-9541 or 800-842-7293 or visit its website to find out more about what to see and do and where to stay and eat. For information on staying at the historic Hotel Monte Vista, see the hotel’s website. For information on the DuBeau International Hostel, visit its website.